Dustin Johnson returned to golf’s coveted No1 spot with a third-place finish at the Tour Championship on Sunday – replacing Justin Rose who finished one shot back in fourth. The 2016 Olympic champion Rose will be replaced as world number one by Johnson when the new rankings are released later on Monday. But there was more than a little consolation for Rose, who claimed the FedEx Cup trophy after his showing at Atlanta’s East Lake Golf Course – and took home a $10 million FedEx Cup winner’s cheque. It left the 38-year-old Englishman satisfied as he gears up for the Ryder Cup with Europe which starts this weekend. “There were a lot of scenarios at play this week and that’s what the beauty of this format is,” Rose said. 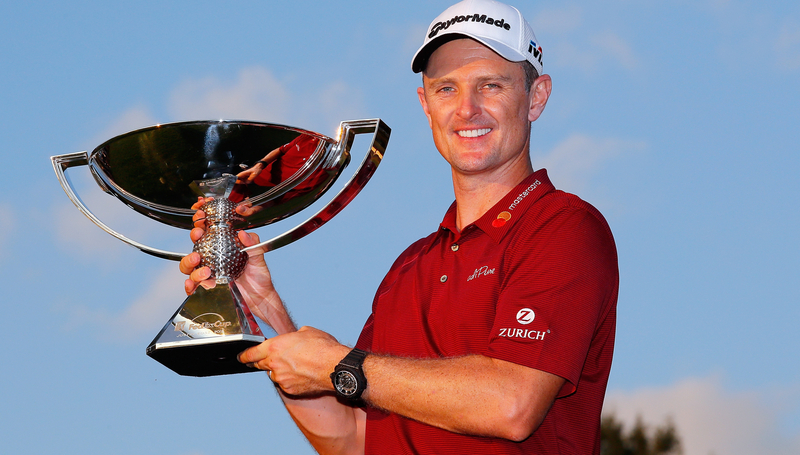 “I think obviously for me this year it rewarded consistent golf. “I was trying to do my best to win this golf tournament and scoop the double jackpot. “But far and away, being next to this trophy is something I’m very, very proud of, and it was -definitely with five, six holes to play, it was pretty precarious. The American had first moved to world number one in February 2017 and remained atop the rankings for 64 weeks until the second week in May this year. The Florida golfer then returned to top spot four weeks after Justin Thomas had seized the title and with Johnson staying atop of the rankings for a further 13 weeks until Rose finished runner-up in the BMW Championship in Philadelphia. Tiger Woods, who ended a five-year winless drought to capture an 80th PGA Tour title in Atlanta, has moved-up a further eight places to be the new World No13. An emotional Tiger Woods fought back tears after completing one of the greatest comebacks in sport with victory in the season-ending Tour Championship amid amazing scenes in Atlanta. And only a birdie on the 72nd hole from Justin Rose prevented Woods from claiming the overall FedEx Cup title as well, Rose two-putting from 25 feet on the par-five 18th to claim the £7.6million bonus in nerve-racking fashion. Chasing a first win since 2013 and the 80th PGA Tour title of his career, Woods took a three-shot lead over Rose and Rory McIlroy into the last day at East Lake. And the 14-time major winner was never in serious danger of getting caught despite a late stumble, completing a closing 71 to finish 11 under par, two shots ahead of fellow American Billy Horschel. It was a day that many thought might never happen again after Woods underwent spinal fusion surgery in April last year and thousands of his delirious fans spilled onto the 18th fairway to follow their idol to the green after his approach found a greenside bunker. Chants of “U-S-A” and “Tiger, Tiger” broke out before playing partner McIlroy could attempt his eagle putt, McIlroy wisely then tapping in for his birdie in a disappointing 74 to leave the stage clear. And, although Woods could not match it, he held his arms aloft in celebration of a brilliant win just days before the Ryder Cup gets under way in Paris. 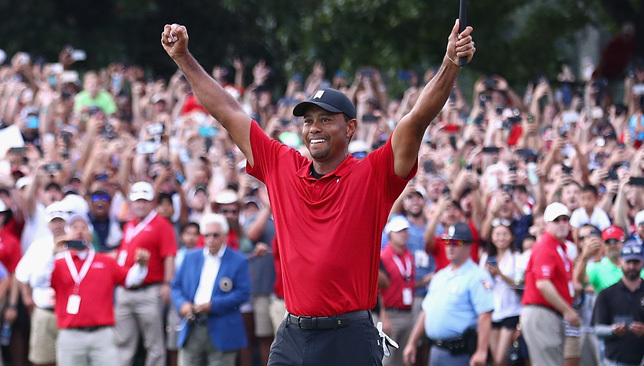 “At the beginning of the year [winning] was a tall order, but as the year progressed and I proved that I could play and I found a swing and put pieces together I knew I could do it again,” Woods told Golf Channel. “I was having a hard time not crying on that last hole. After Rory tapped in I started tearing up a little bit. I just can’t believe I’ve pulled this off. It’s been tough. “I’ve had it not so easy the last couple of years and worked my way back and couldn’t have done it without the help of everyone around me. Some of the players I saw after on the 18th green knew what I was struggling with and it was really special to see them there. It was also hard to believe Rose could birdie the last to scramble into the tie for fourth which was enough to win the FedEx Cup after he had dropped three shots in the space of six holes on the back nine. “I guess it all boiled down to the 18th and I had the swing of the week off the tee there,” Rose told Sky Sports. “I had a jumpy 7-iron lie and it caught a break, killed it in the top of the bunker and bobbled on to the green. I was waiting for a break all day and to get it on the last was great timing. “I felt more pressure as I was throwing it away, but when I got back to knowing what I had to do I clicked into gear in the nick of time. 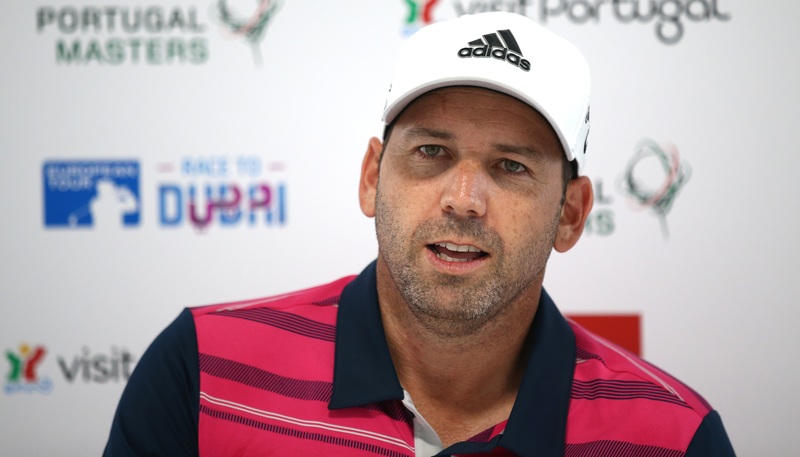 Sergio Garcia insists he has nothing to prove ahead of next week’s Ryder Cup, despite his controversial wild card selection. Garcia won the 2017 Masters but has missed the cut in his last five major championship starts, with his only top-10 finish in a strokeplay event since March coming in the French Open at the Ryder Cup venue of Le Golf National. “I don’t need to show anyone,” the 38-year-old said ahead of the Portugal Masters in Vilamoura. “The only thing I have to do is go out there and help team Europe, my team-mates and my captain and vice-captains – not only with the game on the golf course but outside, in the team room and everything. Garcia has not competed since the middle of August, a tie for 24th in the Wyndham Championship proving insufficient to qualify for the play-offs via the top 125 on the FedEx Cup standings. “I told Thomas, ‘If you end up picking me, I’ll make sure that I play something coming into the Ryder Cup’,” added Garcia, who needs three points in Paris to overtake Nick Faldo as the top European points scorer in Ryder Cup history. “I didn’t want to be without playing for four or five weeks coming into such a big and amazing event. Portugal seemed like a good fit and I’m happy that I decided to come here. Obviously the course is nice, it’s going to be a good test and I’m excited for it. “I took a couple of weeks off and started practising again. The game feels pretty good. Obviously there are some things here and there that I would love to do a little bit better and that’s what I’m working on. The game overall feels good. “It’s just a matter of hopefully getting some good momentum, start building on that. If I can do that then I can gain some confidence and some good rhythm, that’s the goal this week. Denmark’s Thorbjorn Olesen is the only other member of the Ryder Cup team competing in Vilamoura, a place he knows well. “It’s a place I always like to come back to,” Olesen said. “I actually went here earlier this year to train for five days with my coach and caddie. It’s a place I’ve always enjoyed coming to – nice weather, good food. “I feel like I know the course really well. I haven’t particularly performed the last few years here but I still feel like I’ve played pretty well. Qualifying for the Ryder Cup didn’t make a change at all.